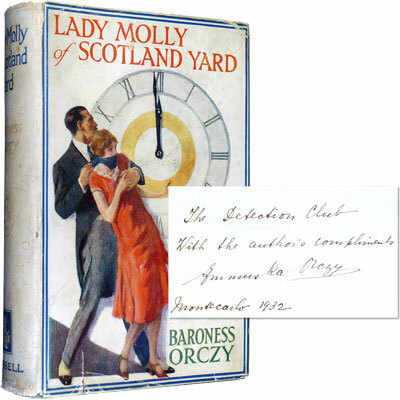 Lady Molly of Scotland Yard – Inscribed to the Detection Club - Baroness Orczy 1928 April - Cassell and Company, London - Second Impression of the popular edition	A unique and important association copy. A gift from Baroness Orczy to the ‘Detection Club’, whose founder members include Anthony Berkeley, Dorothy L. Sayers, Agatha Christie and Freeman Wills Crofts. Baroness Orczy was initiated into the club in 1930. In a rare example of the dust jacket which is scarce in any of the early editions. Containing 12 short stories about Lady Molly Robertson-Kirk, one of the early female sleuths who fictionally joins the police force to head up the ‘Female Department of the Yard’, a decade before women were actually allowed to join. Baroness Emmuska Orczy (1865-1947), British author, artist, and creator of the now famous genre of ‘armchair detective’. ‘When Baroness Orczy was a struggling young author in London, before the success of The Scarlet Pimpernel, the editor of the Pearson magazines suggested she profit from the popularity of Sherlock Holmes by writing a series of detective stories. The result was The Old Man in the Corner, one of the great figures in the early detective story. During World War I, she founded the Women of England’s Active Service League, which listed over 20,000 young volunteers, who canvassed across Britain to convince young men to join the war effort. First published by Cassell in 1910. References: Ellery Queen, The Detective Short Story, 83. Herbert, The Oxford Companion to Crime & Mystery Writing, 319. Reilly,Twentieth-Century Crime and Mystery Writers (1980), 1139.